Electrically lock your bathroom/ensuite from an adjacent occupant until usage is complete. Flexible plans suit both secure and non-secure access between adjacent rooms. Doors default to ‘Unlocked’ during power failure. Alarm contact can be extended to a buzzer or remote system if a ‘locked’ door is breached. 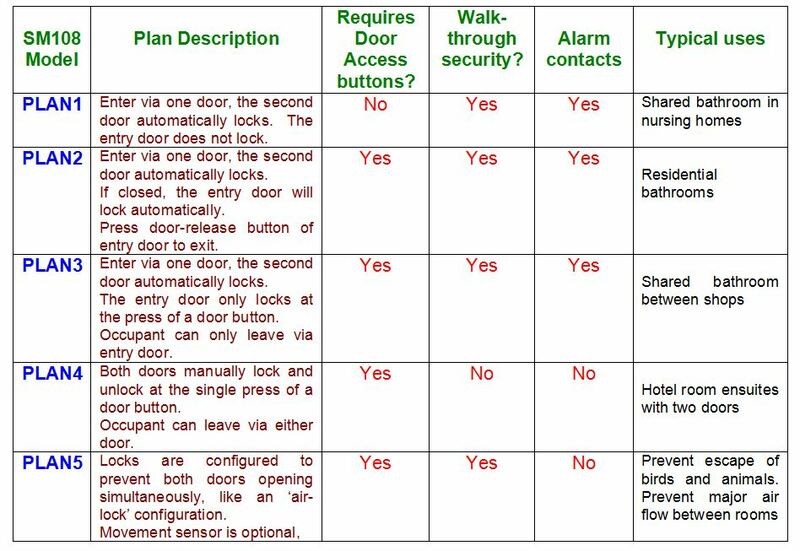 This system may be used to control electric door latches on a bathroom/ensuite that is shared between two apartments or rooms. It ensures ready access for each room occupant, while maintaining the privacy and security of a personal bathroom. Access doors may be hinged or sliding or both, as electric door latches may be selected to suit different room layouts. All installations are intrinsically safe, operating from low voltage DC and Australian approved power supplies. During emergency events or mains power failures, any locked rooms will automatically unlock. If the bathroom lighting and/or exhaust fan has been connected to the room controller, then the lights will be automatically activated whenever anyone enters the room. They will remain on as long as the room is occupied and will turn off Door lock a few minutes after the room is vacated. Five basic plans are available. This table provides a brief indication of the differences between each plan, so that the ideal one can be selected for a specific installation. Click on the link below for the current manual describing full details on operation and installation of the SM108 system.​ Current pricing for all system components is shown at the bottom of this page. Also downloadable below are additional drawings of latch dimensions. The appropriate switch type should be specified when ordering either of the magnetic latches. Where sufficient space exists above the door, the Recessed Ball Switch is a good choice as it remains concealed when the door is closed. However, some door frames lack the space for this option and the Surface Mounted Switch is a better fit. Both styles perform the same electrical function. In some situations, such as laboratory rooms, a more basic form of interlock is all that is needed, where only one door may be used at a time. When any door is opened, all other doors have their latches energised and become locked. When all doors are closed, then all doors are unlocked. A simple circuit consisting of door latches and a 12V power supply is described within the viewable pdf file below. No control SM108 controller unit is required for this basic arrangement. Click on the link below to download this simplified latch arrangement .